Housing shortages and poor indoor climate calls for building renovation with citizens’ health and well-being in mind. 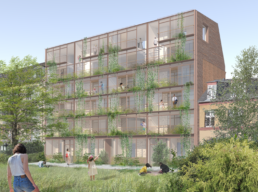 Living in Light is a Nordic project that explores how architectural design and environmental standards can be integrated into building renovation, emphasizing natural light and air quality. An example of such a renovation can be found in Valby, where an apartment building has been fully renovated with these values in mind. To the side of the building facing the courtyard, a glass extension has been built. The extension allows maximum natural light to flow into the apartments. The apartments have also been updated with indoor garden-like areas, increasing natural ventilation in the homes. Two extra floors have been added to the block, which has been fully energy optimized: solar panels are now in place on the roof, upgrading the building’s energy class from E to A+. The building, which dates back to 1899, has been renovated based on Active House principles, characterized by daylight optimization, sustainable material use, healthy indoor climate, energy optimization and reducing energy and water consumption. The renovation is also mindful of preserving cultural heritage. To ensure the building’s existing historical features were preserved in line with its surroundings, the glass extension was built on the interior, courtyard-facing side of the building. Two floors have been added to the building and the glass “membrane” has created an area that can be be used as an indoor “garden”. With a glass extension and balconies, residents can enjoy sunlight and fresh air which are essential to health and well-being, especially in the winter months when there is less daylight. While energy upgrades in some cases result in poorer indoor climate, Living in Light has managed to improve the indoor environment, while also improving the energy class from E to A+. Living in Light creates better homes in existing buildings, instead of tearing down old buildings with worn structures yet significant historical value.